As we begin this new year, let’s look back on the past one and discover those moments when we were aware of God‘s presence in our midst. I tend to think God is present when things are going the way I think they should, so for me the real challenge is discerning God’s presence when things do not go as I had hoped. For many people at home and abroad, 2017 was the latter: a difficult, even tragic, and challenging year. 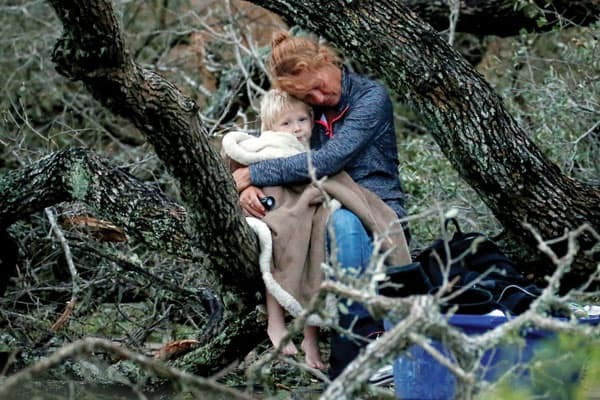 Lisa Rehr embraces her 4-year-old son, Maximus, as they await rescue during Hurricane Harvey in Rockport, Texas. Disastrous floods swept through China, Nepal, Bangladesh and Peru, impacting millions of people. Hurricane Maria devastated Puerto Rico and other Caribbean Island nations. Hurricane Irma wreaked havoc on Cuba and the Gulf Coast of Florida, and Hurricane Harvey brought to Houston and large parts of the Gulf Coast the worst flooding in years. In Europe, terrorist attacks killed dozens of innocent men, women and children, injured hundreds more and damaged the social fabric of societies and countries that are considered stable and prosperous. 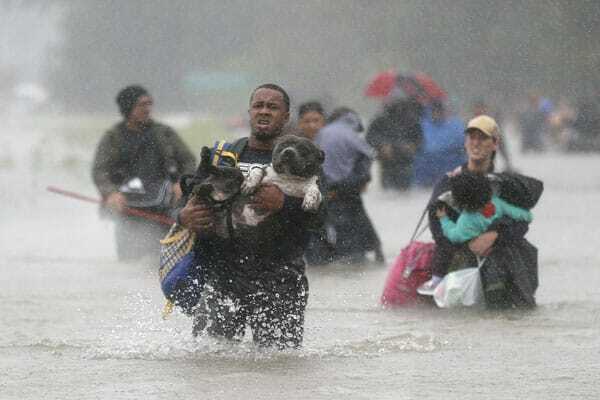 Isiah Courtney carries his dog through floodwaters from Hurricane Harvey in Beaumont Place, Texas. In our own country mass shootings seemed to be on the rise, from the January shooting at the Fort Lauderdale airport to the October slaughter of 58 people and the wounding of more than 500 others at a concert in Las Vegas, soon followed by the massacre of 26 people in a church in rural Texas. At the same time the violence and destruction continues in Iraq, Yemen and Afghanistan. Civil war continues in South Sudan, where three Maryknoll priests struggle to feed the hungry and minister to the displaced, while drought and famine also plague other parts of Africa, and various violent situations on that continent do not even make the international news. Add to the list the earthquakes in Mexico, China and Italy and massive wildfires across the Western United States and Canada and the picture appears truly apocalyptic. 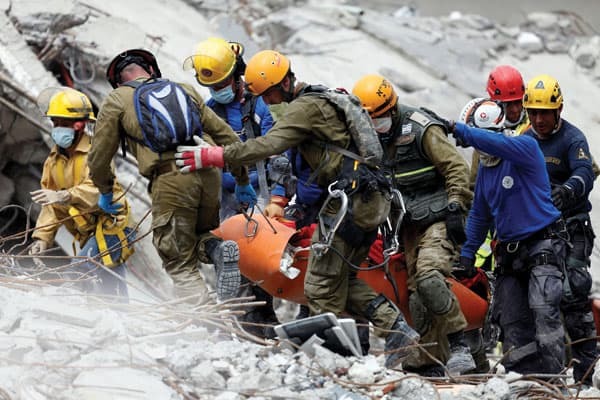 Israeli and Mexican rescue teams recover a body after the Sept. 19 Mexico City earthquake. However, the outpouring of compassion that has marked each of these disasters, whether natural or human-made, points beyond ourselves to God among us. I think of those who shielded wounded loved ones, friends and even complete strangers during the Las Vegas concert shooting, of the untold number of people who helped rescue victims in all deadly natural disasters this past year, and the outpouring of aid for storm victims from parishes and businesses and non-profit organizations around the country, of the many volunteers who have gone to storm-ravaged areas, especially Puerto Rico, which was battered by two of these massive hurricanes. All the examples of compassion great or small arising in these natural disasters, wars and violence reflect the realization that we are all children of God. The suffering of my neighbor down the street and the suffering of a victim of violence or a natural disaster on the other side of the world impact and challenge each and every one of us. God is present when we are moved to prayer and action to help those afflicted by violence and death. 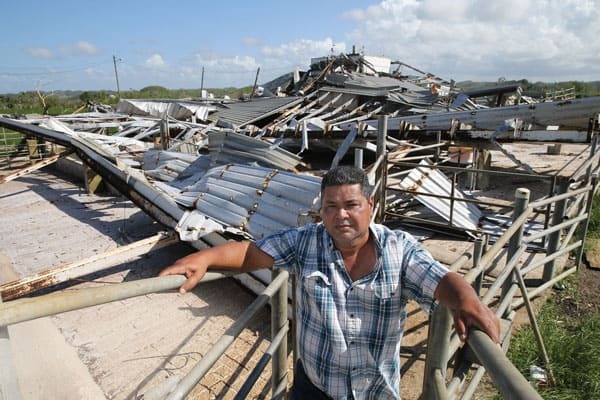 Gustavo Toledo stands by his destroyed dairy farm in Hatillo, Puerto Rico, after Hurricane Maria devastated the island. As we face the new challenges 2018 will bring, my prayer is that we can listen and respond to the invitations of our God of Life. May we realize that we are indeed all one and that the suffering and impoverishment of our brothers and sisters around the world diminishes each of us, just as their rejoicing brings new life to each of us. Featured Image: Mourners hold a candlelight vigil in memory of the victims of the Oct. 1 mass shooting in Las Vegas. Father Raymond J. Finch is the superior general of the Maryknoll Fathers and Brothers, a position he also held from 1996 to 2002. 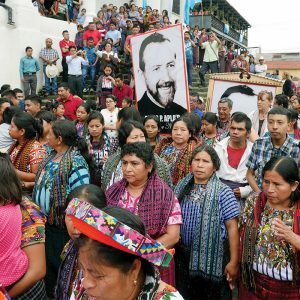 Originally from Brooklyn, New York, Father Finch served in Peru for 23 years, working mostly with the Aymara indigenous people in the southern Andean highlands. He has also served as director of the Maryknoll Center for Mission in Latin America in Cochabamba, Bolivia, and as the Maryknoll Society’s assistant regional superior and regional superior in Latin America.